The story of the Minneapolis Metrodome's inception has been repeated again and again in the birth of covered stadiums across the United States: the president of a major league sports team threatens to move to another city unless their home base provides more profitable facilities. In 1973 the Minnesota Vikings were one of the best teams in the National Football League; their lease for the twenty-year-old, open-air Metropolitan Stadium was due to expire in two years. Vikings president Max Winter publicly flirted with the cities of Montreal, Phoenix and Memphis before threatening to leave Minneapolis. He argued that the Vikings needed profits from luxury boxes--in spite of the fact that they were netting $5 million a year--and that he would be better able to woo top players if he could guarantee a comfortable playing climate. Similarly, the Minnesota Twins were considering a move. A journalist from the Minneapolis Star-Tribune wrote that the political process preceding construction was "as agonizing an experience as anything that has divided Minnesotans in recent years," but local business interests pushed the stadium's construction through by arguing that major-league teams were essential to the financial health of the city, and that Minneapolis would be no more than a "cold Omaha" without the Vikings and the Twins. 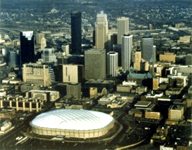 When finished in 1981, the 195-foot high Minneapolis Metrodome was the world's largest air-supported, multi-use facility, covering 9.5 acres and offering a seating capacity of 63,000. The roof structure is made of curved, teflon-coated fiberglass panels fastened to a skewed net of cables which span the dome. Weighing about 1.5 pounds per square foot, the roof is kept inflated by twenty 90-horsepower fans. 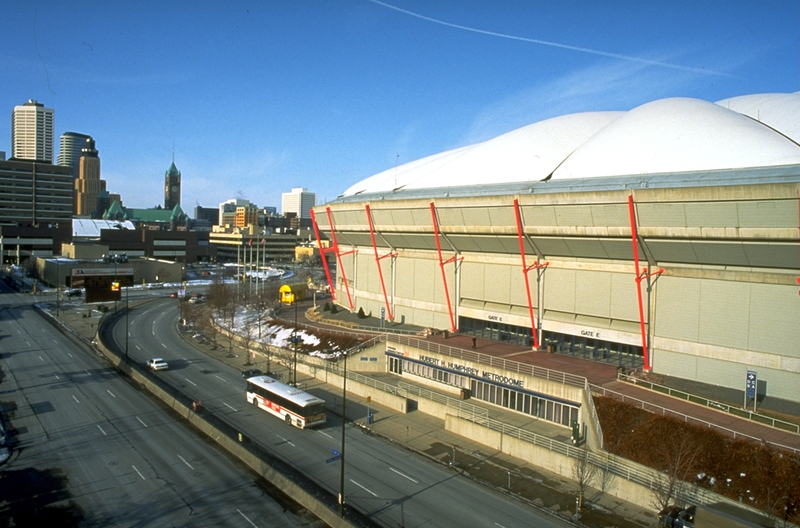 The total price for the Metrodome was $80 million; the structure itself cost approximately $55 million, which was supported through revenue bond financing supported with a 10% hotel-motel and a liquor tax. The City of Minneapolis reconfigured streets and utilities at its own cost, and the business community donated land in downtown Minneapolis near I-94, in an area called Industry Square. The decision to use a fabric roof was made by comparing the construction figures of the recently-completed fabric-roofed Pontiac Silverdome in Michigan, finished for $55.7 million, and the steel-trussed Louisiana Superdome in New Orleans, which cost nearly three times as much at $195 million. The Minneapolis Metrodome is one of the few financial success stories in the saga of American covered stadiums. It has turned a profit every year that it has been in operation. However, the urbanistic and architectural sacrifices made to keep the balance books in the black may not have been worth the cost. Engineered by David Geiger, who also helped design the U.S. Pavilion for Expo `70 in Osaka, the Metrodome entirely lacks Osaka's breathtaking elegance or simplicity. Architects Skidmore, Owings and Merrill (Chicago) were offered extremely limited funds, and in response they fast-tracked a budget building: the Metrodome is clunky and scaleless, and the design makes little attempt to create a street or civic presence that could have proved a model for the new developments that succeeded it. Other budget-cutting measures included no air conditioning, which had to be added later, and virtually no parking, which has proved a headache to the city of Minneapolis ever since. Ryan, Ann Katheryn. "The Genesis of the Metrodome." Greater Minneapolis: The Magazine of Twin Cities Business Management 34, no. 2 (March-April 1982): 8-22, 88. Zosel, Scott. "Building the Metrodome." Greater Minneapolis Same as above, pages 54-60.